Two piece straps are different from my usual vintage straps in that they fit without the strap crossing the back of the watch case. They are more suited in design and style to modern watches with horns and bars rather than watches with fixed wire lugs. Two piece open end straps will fit any case with either fixed bars or spring bars. You can fit them yourself, no special tools or techniques are required. The two strap pieces have open ends that wrap around the bars and are then fixed together with a metal "tin tab", or they can be glued together if you prefer, or both if you are a "belt and braces" type. I can also supply two piece closed end straps that are only suitable for watches with removable or spring bars. In either case there is a single thickness of leather between the bar and the case, which can aid fitting if the bars are close to the case. However, this inevitably affects the durability of the strap because it is only single thickness where it wraps around the bars. I don't recall getting any complaints about the ones that I have supplied, but I can't guarantee that they will last as long as my normal straps. If you are not familiar with my designs of vintage watch straps, please have a look at the page about My Designs of Vintage Watch Straps and read the details on this page before you place an order. I don't keep any two piece straps in stock, they are all made to order. Please allow two to three weeks for your strap to be made. I can't ask the workshop to make just one strap, I have to feed my orders into production in batches and it takes a few days to get a batch together, and then things like holidays or sickness can intervene. Straight: Two piece open end or closed end ‘straight’ (parallel sided) straps are available in widths from 8mm to 24mm in 2mm increments in any length and in your choice of leather colour. Tapered: I can also supply two piece open end or closed end straps that taper from the width of the watch lug to a narrower buckle in 2mm increments from 8mm to 24mm. 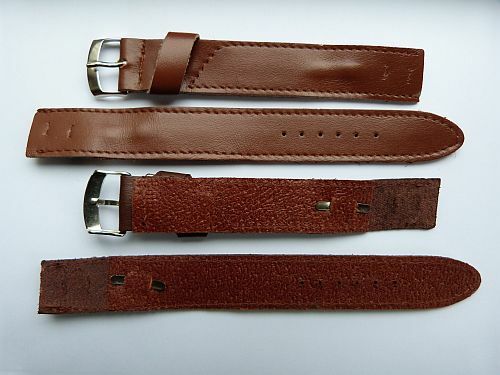 Keepers: Two piece straps in standard sizes (16mm, 18mm, 20mm, etc.) are usually made with a metal keeper. However, Because of the difficulty of sourcing and stocking metal keepers in every possible size, unusual size straps (usually smaller widths) will be supplied with a leather keeper, either straight across or angled leather keeper like the one shown in the image. If you specifically want a straight or angled leather keeper, specify this in the notes box. If you specifically want a metal keeper in an unusual size, then please inquire about availability before ordering. Because the overall length of the strap and watch combined is affected by the size of the watch I can't offer to make the strap the correct length for your wrist. The two sizes specified below are based on many years of experience and thousands of straps supplied. However, if you know that you have problems with "over the counter" straps, then read the notes about custom lengths. The two pieces comprise a shorter "buckle" side and a longer "tail", which has the holes for the buckle pin. The standard length of the leather parts without the buckle are about 80/125mm, there is also a standard extra long XL which is about 110/135mm. If you usually find standard straps a bit long or short for your wrist and watch combination and you know by how much, e.g. 10mm, make a note of how much in the Notes box and I will adjust the standard size by that amount. If you know how long you want the buckle side and the tail side, then put those measurements in the Notes box. The tapered straps need special individual cutters and therefore can only be made in standard and extra long lengths. The standard length is again about 80/125mm and the XL 110/135mm. Standard buckles in base metal are available in either silver or gold colour. These are the buckles that will be supplied with straps ordered from this page. I will generally try to supply a vintage style buckle, but buckle styles are restricted to what I can source so I don't have a wide choice available. If your watch is fitted with a buckle that you would like to re-use, this is no problem; I have done this many times for customers. If the buckle uses spring bars we can simply leave off the standard buckle, but if it is an older type buckle that needs to be stitched in, you need to post the buckle to me and we will get it stitched into the strap as it is made. Email me for posting details. If you don't have a matching metal keeper loop, I can get the workshop to make a leather loop in the same leather as the strap. If you have a vintage watch with a gold or silver case you might be interested in my hand made nine carat gold or sterling silver buckles, but please bear in mind that these are replicas of Great War era buckles and are only suitable in style for watches from that era with fixed wire lug cases. If you want the stitching in a contrasting colour, please put this in the Notes box, e.g. "red stitching". To place an order please select your requirements from the drop down lists in the Order Two Piece Open End or Closed End Straps below and clicking the PayPal button. The button below allows you to place an order for either a straight open ended strap or closed ended two piece strap with a standard base metal buckle in either silver or gold colour. Please make sure you have read the details above so that you know what you will be getting. Please allow two to three weeks for your strap to be made. I can't ask the workshop to make just one strap, I have to feed my orders into production in batches and it takes a few days to get a batch together. Please remember to add postage and packing to your order - after pressing the "Add to Cart" button, use your browser's back arrow ← button to return from PayPal to this page and click on the postage and packing that you need.